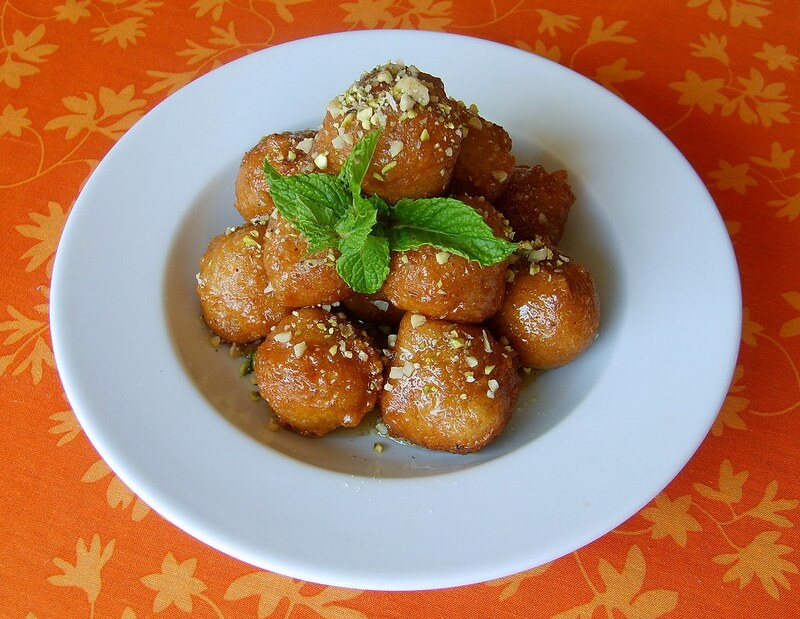 Loukoumades (Greek Donuts) remind me of summertime. I guess it's because my husband and I would travel to Greece during this time of year, and we would also attend just about every Greek festival in the Bay Area during summer. The best Loukoumades that I've ever had were at the Belmont Greek Festival, which is held over Labor Day weekend. The line for Loukoumades would wrap around the building for people to get a bowl of piping hot donuts dipped in warm honey syrup. But since they're not vegan, no more Belmont for us...so I wanted to make my own version and they are just as delicious if not more! Everything tastes better when you take the time to make it yourself! I used to have a great recipe for Loukoumades (kind of like a brioche dough) that I wanted to veganize, but I couldn't find it and so I had to start over experimenting with recipes to get the right texture and flavor. Actually, I made a batch of these on Saturday night when I had family visiting, but the dough was very difficult to work with. So my daughter-in-law, who went to pastry school and is an excellent baker, and I sat around afterwards discussing ways to revise the recipe. We thought about reducing the yeast, reducing the soy, adding more flour, chilling the dough before frying and so I made another batch incorporating some of these changes, but they still weren't right. I was about to give up because there is only so much fried-sugary food I want to put in my body, but I'm glad that I gave it another shot because as you can see they are perfect little balls of gooey goodness. In a large bowl add warm water and yeast and let sit for about five minutes to proof yeast. Add warm soy milk, agave, ground flax, vanilla extract, salt and whisk to combine. Cover with plastic wrap and let proof for about two hours. Add canola oil to a deep dutch oven or pan and heat over medium heat to 350 degrees with a deep fry thermometer. Remove plastic from bowl and stir dough a couple of times to remove air bubbles. Using a small 1 tbsp ice cream scooper or a regular tablespoon, spray it lightly with canola and then scoop the dough and drop directly into the hot canola oil. Work with about 6-8 donuts at a time turning them frequently so that they brown evenly. Remove from oil with a large slotted spoon and drain on paper towels. 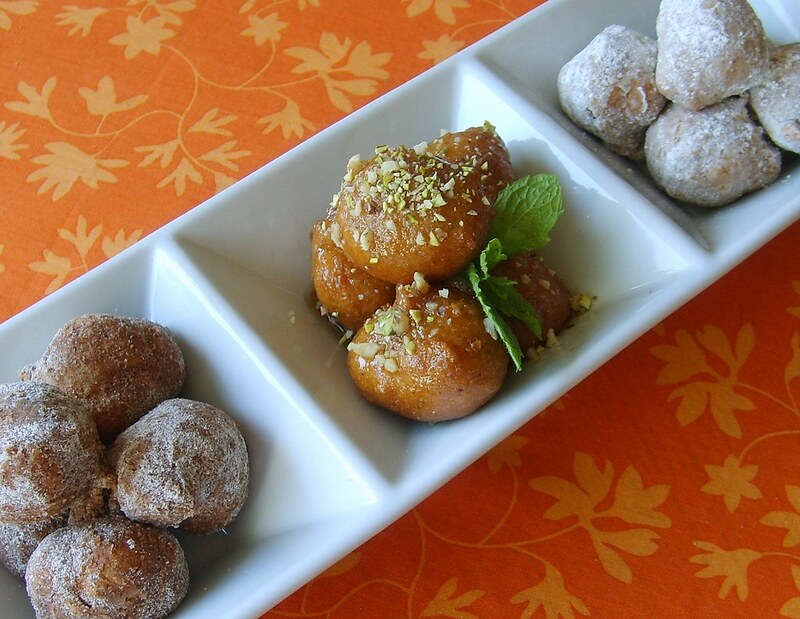 While donuts are still hot, toss them in the orange-cinnamon syrup and top with finely chopped walnuts and pistachios. This recipe makes a lot of donuts so I dipped some in cinnamon sugar and powdered sugar as well. These donuts are best eaten warm, just after frying. In a small sauce pan, add agave syrup and water, bring to a boil and then reduce to a simmer. Cook for about 15 minutes until sauce thickens. You can tell when it's ready because it will start foaming. To check consistency, spoon a little on to a plate and hold the plate at an angle. You still want it to drip, but you want it to be a little thicker than maple syrup so that it coats the donuts nicely. Remove syrup from heat and let cool. The syrup will thicken as it cools, so you may need to add a little more water to thin out. Once cool, stir in orange zest, vanilla, lemon juice and cinnamon and stir to combine.